Gene Leahy Mall is a serene haven in the heart of Omaha. The nearly ten-acre park includes a large lagoon, waterfalls, and abundant green space for jogging, biking, or simply basking in the beauties of nature. Sandy play areas for younger children allow for creative building, while the horseshoe pit sees frequent use by residents in this trendy downtown area. Gene Leahy Mall features a full amphitheater venue that hosts numerous live performances throughout the year, but it is perhaps best known for the elaborate Christmas lights that adorn it each year during the holiday season. Nestled into the heart of downtown Omaha, the Gene Leahy Mall features a number of hiking, jogging, and bike paths that encircle a sizable lagoon. Autumn leaves provide a beautiful annual display in this pastoral area, while an extensive Christmas light display adds a touch of festivity to the Mall. Many local residents gather at the Gene Leahy Mall to take in one of the wide range of concerts or plays at the Amphitheater, while others enjoy friendly competition around the horseshoe pit. For younger children, a variety of playground equipment is available, including two large slides and a sizable sandy free-play area. Beautiful waterfalls, a picturesque bridge and a duck pond provide additional interest for this exquisite park setting. Gene Leahy Mall was named after a former Omaha mayor, Eugene Leahy, and recently underwent a major renovation. 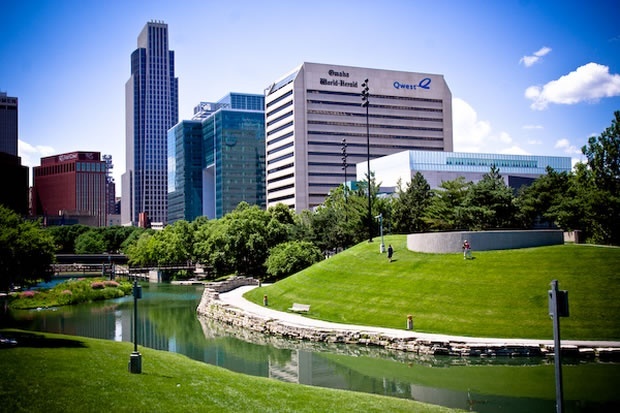 The close proximity of the public library and the Old Market make this a popular picnicking spot; photographers can often be spotted at the Gene Leahy Mall as well due to its outstanding vantage point on the Omaha skyline. The Omaha Summer Arts Festival, which incorporates both the Brewfest and Tastefest events, is an annual event at this peaceful public park. Gene Leahy Mall is connected to the larger Heartland of America Park via a small area of greenspace. Photo above courtesy of BobbyProm.